What sorts of things can go wrong in the Arctic? HMCS Toronto and the Canadian Coast Guard Ship (CCGS) Pierre Radisson in Hudson Strait. Photo by Sergent Kevin MacAulay. Downloaded from the Canadian Forces web site. The number of cruise ships visiting the Arctic rose form 50 in 2004 to 250 in 2007. Most increases were in Nunavut and Greenland (Arctic Waterways Need Protection). 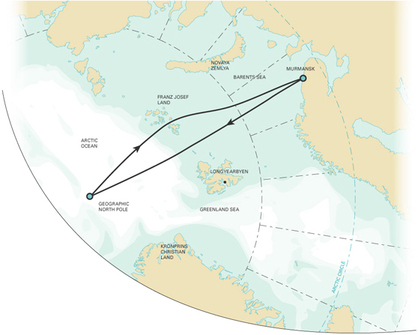 The data is from Appendix F to the proceedings of the Arctic Marine Transport Workshop. The figure only includes complete transits through September 2004. There were 99 of these. If a transit took several years, it was assigned to the year it was completed. Submarine transits have not been counted because only two have been reported. The first polar cruise ship to sink was a "veteran ice-strengthened vessel designed and purposefully outfitted for polar travel." Not all polar cruise ships are. The Explorer, which sank in the Antarctic last November, was no stranger to Arctic Canada - in fact - in 1984 it was the first cruise ship to transit the Northwest Passage. Emma Stewart and Dianne Draper explain what happened, and what it means for Arctic cruise tourism The Sinking of the MS Explore: Implications for Cruise Tourism in Arctic Canada. Everyone got off safely, but the passengers and some crew sat in lifeboats for four or five hours before help came. It was lucky that the weather was good and there were other vessels nearby. U.S. Coast Guard officials say they expect seven cruise ships with over 3,000 visitors to visit Alaska's northern coasts this summer; over 70, with 150,000 passengers are expected off Greenland. 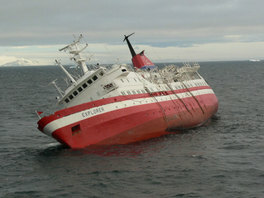 Captain Mike Inman of the USCG is concerned about reponse capabilities in the region if something should go wrong (Arctic countries unprepared for cruise ship accidents: officials (CBC News, June 3). If you'd like to go scuba diving beneath the winter ice of Russia's White Sea, it'll cost $900 to $1,000 to take Aeroflot or Delta from Los Angeles or New York to Moscow. A 27 hour train ride from Moscow to the White Sea, and a week of guided ice-diving, including training, costs another $1,750. So maybe $3,000 in all. For something really special, an ice diving trip at the North Pole runs about $40,000. Two former marine biologists, Dmitri Orlov and Mikhail Safonov, founded the outfit that organized this expedition, the RuDive Group, which offers world-wide scuba tours. In 1996, after the Soviet Union crumbled and science funding dried up, Mr. Safonov and Mr. Orlov began offering diving lessons, and in 1998 they began taking customers to the White Sea. Although cruise travel to the Canadian Arctic has grown steadily since 1984, some commentators have suggested that growth in this sector of the tourism industry might accelerate, given the warming effects of climate change that are making formerly remote Canadian Arctic communities more accessible to cruise vessels. Using sea-ice charts from the Canadian Ice Service, we argue that Global Climate Model predictions of an ice-free Arctic as early as 2050-70 may lead to a false sense of optimism regarding the potential exploitation of all Canadian Arctic waters for tourism purposes. This is because climate warming is altering the character and distribution of sea ice, increasing the likelihood of hull-penetrating, high-latitude, multi-year ice that could cause major pitfalls for future navigation in some places in Arctic Canada. These changes may have negative implications for cruise tourism in the Canadian Arctic, and, in particular, for tourist transits through the Northwest Passage and High Arctic regions. Photo: Reinhard Jahn via Wikipedia. How much is a trip to the North Pole? Quark Expeditions (Quark Expeditions) will send you from Murmansk to the North Pole on the nuclear powered Russian ice breaker 50 Years of Victory for $22,900 to $31,900 per person. You'll fly from Helsinki to Murmansk (I think this is included in the price) and then spend spend about 14 days traveling to and from the pole. Shore landings are planned in Franz Josef Land and at the pole. A helicopter is available to take you sight seeing. When the trip is over you're flown back to Helsinki. All the cabins on the 117 meter 50 Years have outside views and private baths. Her crew and staff of 140 can handle 128 guests Some Of the cabins are suites with sitting rooms. The ship has a dining room, a professional bartender, indoor pool, gym and sauna, a library and store, and other amenities. 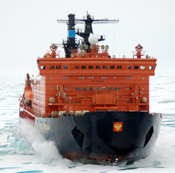 The 50 Years of Victory is part of the fleet of the Murmansk Shipping Company. Source: map and photo from the Quark Expeditions web site.